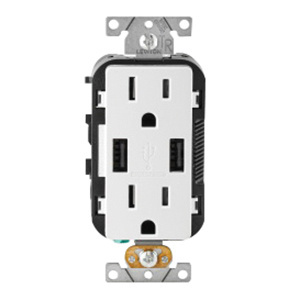 Leviton Tamper-resistant combination receptacle/outlet and USB charger in white color, has voltage rating of 125-Volt AC and current rating of 15-Amps. With back and side wired termination, this receptacle accommodates 14 - 12-AWG conductors. This self-grounding combination receptacle/outlet and USB charger has brass-hot/black-hot, white-neutral and green-ground color-coded terminals for easy user identification. It features thermoplastic cover and body. This decorator duplex combination receptacle/outlet and USB charger comes in NEMA 5-15R configuration. The smart chip recognizes and optimizes the charging requirements of individual devices. Charger has vertically positioned USB ports to offer more space for maneuvering as well as to reduce stress on USB cables. Charger is compatible with USB 2.0 devices. Multi-gangable receptacle ideally sits in a standard wallbox and is compatible with standard wallplates. It has maximum load capacity of 1/2 hp. This combination receptacle/outlet and USB charger features steel strap for superior assembly security. It withstands temperature range of -10 to 40 deg C. This residential -grade receptacle is suitable use in kitchens, bedrooms and home offices, hotels, airports, restaurants, salons, office cubicles and college dorm rooms. It has flammability rating of V0 per UL94 to withstand harsh environmental conditions. Combination receptacle/outlet and USB charger is cCSAus listed and NOM 057 certified.